I love the bright yellow packaging with the fruit picture of the passion fruit, though if you don't know what a passion fruit looks like, you might wonder what that fruit actually is. Passion fruit is considered a 'tropical' fruit since its found in warmer climates and it has its own distinc flavor (sorry it's kind of hard to discribe!) I think they chose the yellow packaging mainly since the inside of a passion fruit is yellow (the outside is a dark purple). 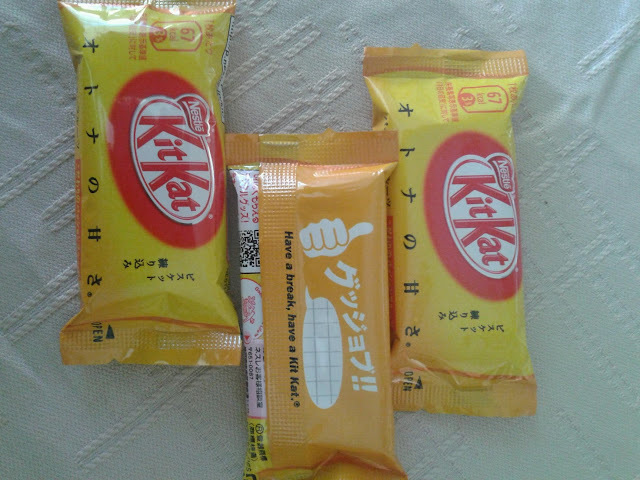 Each mini kit kat is individually wrapped in the same yellow wrapper as the bag. 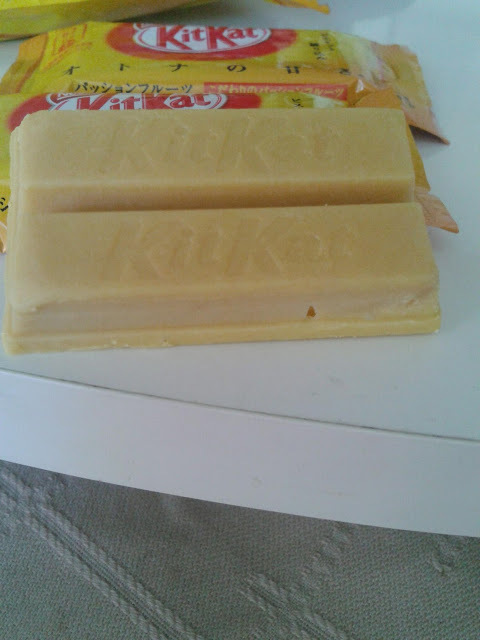 The kit kat itself is a light yellow colored flavored white chocolate/cream. 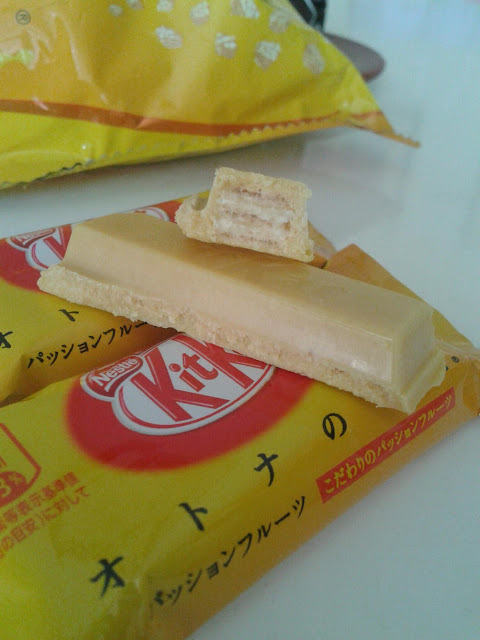 At first bite, you notice the sweet flavor of the creamy chocolate like outside, but you get a slight tartness from the inner layers of the kit kat bar. 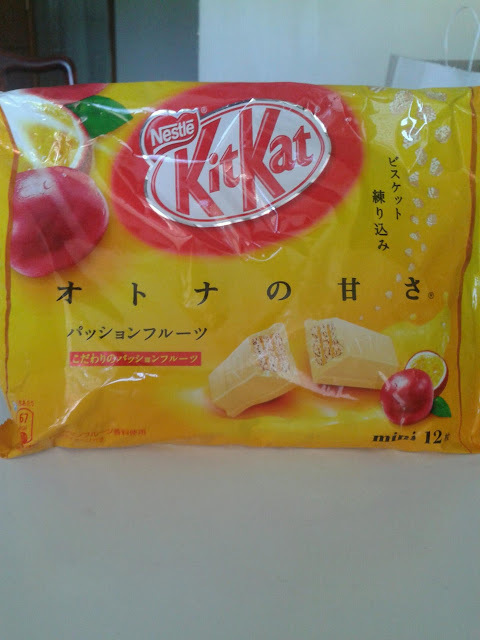 It isn't an overwhelming passion fruit flavor, though you can taste it. The tartness of the center layers work well with the sweeter creamier outside and just gives your mouth an happy experience! If you're into more tropical flavors or have had passion fruit or passion fruit flavored items, are just want to try out something different and new, I would definitely check this product out. I would suggest checking out local Japanese grocery stores (the West Coast I feel would be better finding them than the East Coast). I'd go quick though since these more exotic flavored kit kats tend to run out quicker. I found mines at the Seattle Uwajimaya store.